Rainer K. Gillot received his engineering degree from the University of Stuttgart, Germany in 1974. During his professional career at the State Material Testing Institute (MPA) of the University of Stuttgart, his research activities focussed on large scale testing of components and wide plates. He got his PhD degree for the investigation of the crack arrest behaviour of pressure vessel steels for nuclear power plants. For SMiRT 12 in Stuttgart in 1993, he was chairman of the Organizing Committee. Since then, he served as coordinator of the Fracture Mechanics Division G at several SMiRT conferences. 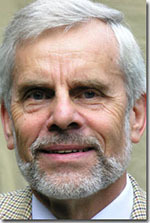 In 2001 he became a member of the Advisory Board. He is handling all actions necessary to comply with the legal requirements resulting from the registration of IASMiRT in Berlin. He retired from MPA Stuttgart in 2005.